Not only does the film industry keep people busy, it keeps Hot ATL Party Bus busy too! Our buses have been used for film production party bus limos in scenes and also to carry cast and crew members to on set events and wrap parties. When Georgia received the tax break for film related productions, that is when Georgia became the Hollywood of the South. Film production companies are flooding Georgia from all around the U. S. Even Los Angeles production companies are coming to the South to film movies, commercials, and more. 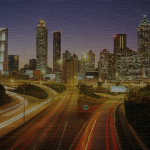 The continued growth is not slowing and the increase of film production just within Atlanta is expected to grow exponentially over the next few years. If you are a film production manager or coordinator and need a film production party bus, we have exactly what you need for your production. If you need to transport your talent or crew to the wrap party, do it in style and in the comforts of one of our party bus limos. Our fleet consist of 16 passenger standard party bus, 20 passenger VIP luxury party bus and 40 passenger VIP luxury party buses. We are licensed and insured, and can provide a certificate of insurance for your production records. Our party buses are fully equipped with the latest technology to include LCD televisions, video gaming systems, CD and iPod, DVD, surround sound systems, open bar and many more amenities. Call today to book a luxury party bus for your film production (404) 543-2052.